“Too Young To Be Broken” (“Chante Encore”) is the BRAND NEW Jonas & The Massive Attraction single released to radio across Canada today, that sees the band delivery a fresh, modern sound, based on their experiences in Afghanistan. 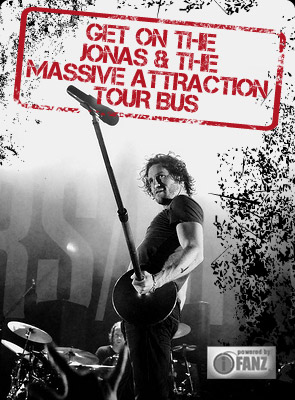 “In 2006 & 2008, Jonas & The Massive Attraction had the honour of being asked to perform in support of the Canadian Peacekeepers in war-torn Afghanistan. It was a profound, eye opening experience for us to be in the middle of a war zone and seeing the effects of war on the innocent children. The youth are truly the most affected by conflict. In working with and supporting War Child Canada, we now realize even more how important this organization is in preserving and rebuilding these war-affected communities that are often left with very little. LISTEN to “Too Young To Be Broken” and “Chante Encore”. The new album LIVE OUT LOUD, including “Too Young To Be Broken”, is available on iTunes at BUY NOW.